At least, not quite yet. I was hoping that since the kitchen renovations started on Monday, everything would be done before Friday, when I have off from work. 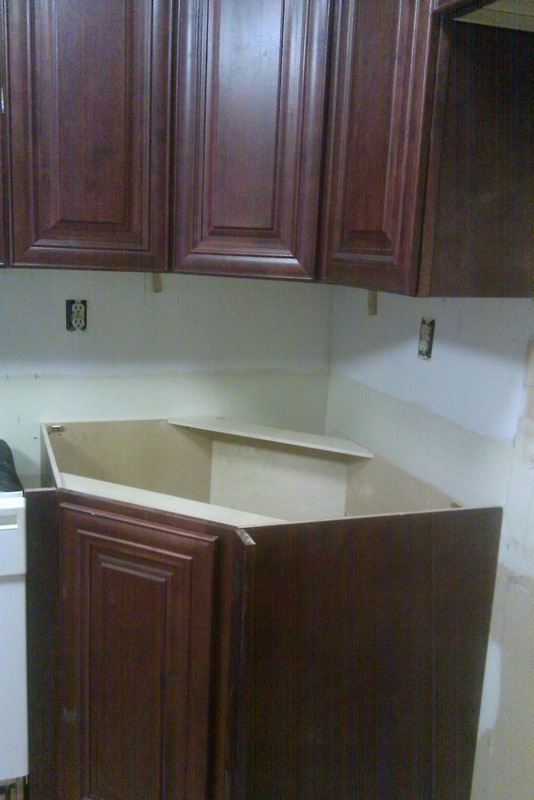 But it looks like the counter top won’t be cut and installed until Monday. 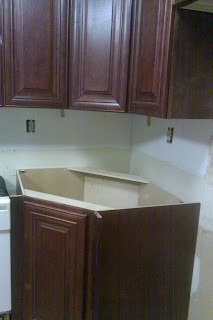 Yesterday the contractor didn’t even come over except to take measurements for the counter top. 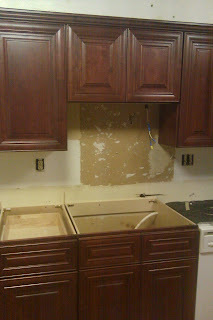 I thought they were going to at least come back and finish installing the drywall in the living room, but it didn’t happen. 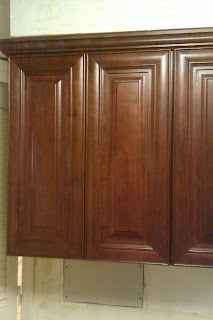 The window installation started yesterday (Home Depot), but two problems cropped up: 1) they forgot to measure the bathroom window in the hall bathroom upstairs, so that window isn’t getting done along with the other ones, and 2) the measurement guy took the wrong measurements for the kitchen windows. 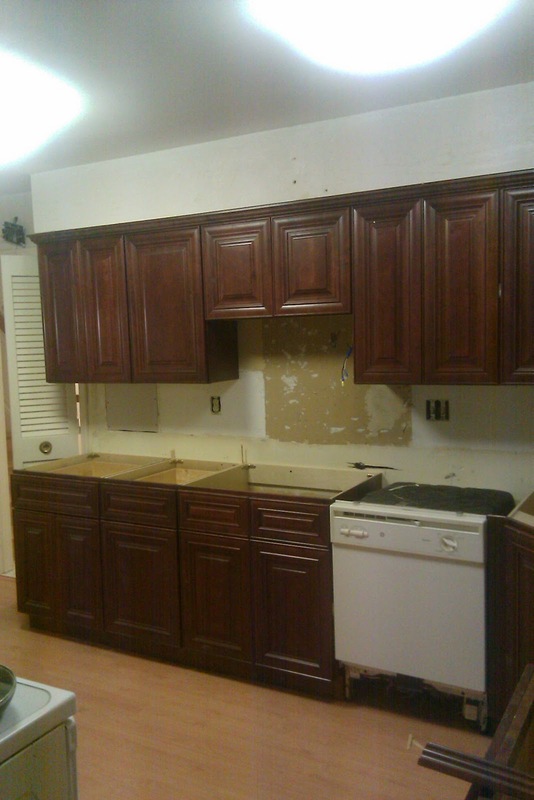 Therefore, there could be a hold up with getting the whole thing done. For now, the upstairs windows have been done, and look fabulous! Today they are coming back to get the lower level completed. I can’t wait until it’s all done! I’m just anxious to get in and start having some normalcy to my life. We’re doing okay here at my mother-in-law’s house, but it’s getting frustrating not being in our new home. And not FEELING like our new home is “home” yet. There are big work tables in the formal living room where Home Depot is cutting the outer wrappings of the windows. And their is dust and dirt everywhere on the floor. Their are nice cabinets, but no sink. Etc. Etc. And the upstairs bedrooms having even really been touched. Our bedroom still has all of it’s wallpaper on it. My goal was to get it done this week. Get the kids’ rooms inhabitable and clean, with curtains and all, and we can at least have a comfortable place to sleep. It’s all coming together, but just a lot slower than I had anticipated. I’m just anxious to get in and start feeling comfy and cozy there. We’re not big celebrator’s of Christmas, so not being in the house prior to the holidays doesn’t really mean much to us. We will be using tomorrow (Christmas Eve) and the weekend to hopefully finish up the most important projects. I also have this knot of anxiety in my belly because of the financial worry about being able to manage and maintain a house like this. I’ve got every penny budgeted from future paychecks. It basically means that I can no longer just run to the store and frivolously buy whatever I want, which is what I used to do. 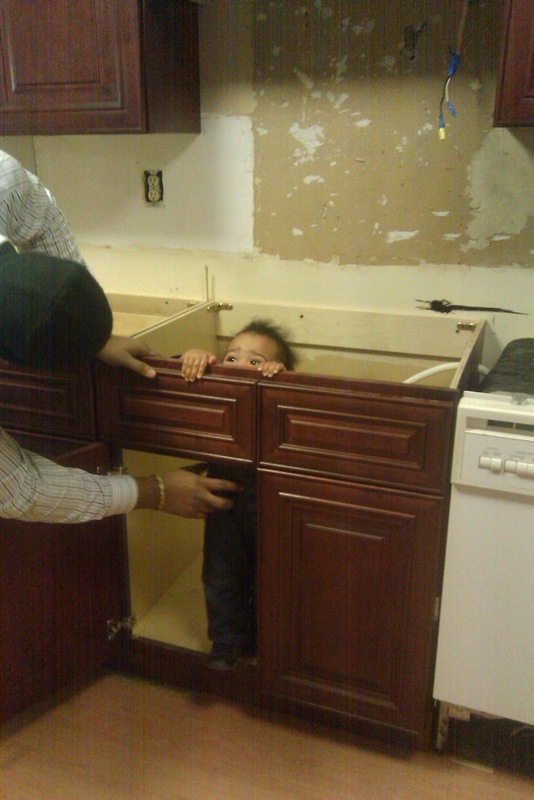 I would spend TONS of money on groceries and food, even if we had food to eat in the cabinets. It required no discipline previously. Now, I have to be disciplined, and I think it’s scaring me a little bit. It’s a feeling of apprehension, like, “What if something goes wrong? What if one of us loses our job? What if something big happens and we can’t afford to fix it?” I wonder if these are normal emotions that most people feel when they step up in home ownership and when their expenses increase? I just don’t know. But I do know that we are going to make it work and we will thrive. And the best part is that our oldest son starts school this coming year so that’s daycare money we won’t have to pay! Anyhow, here are the latest pics! 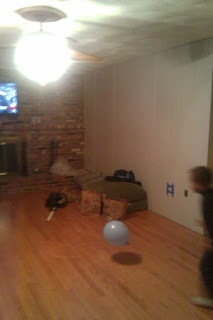 The family room is now having that God-awful wood paneling removed and dry-wall installed. WOOT! Close-up of the new cabinet. We haven’t put the hardware on yet. 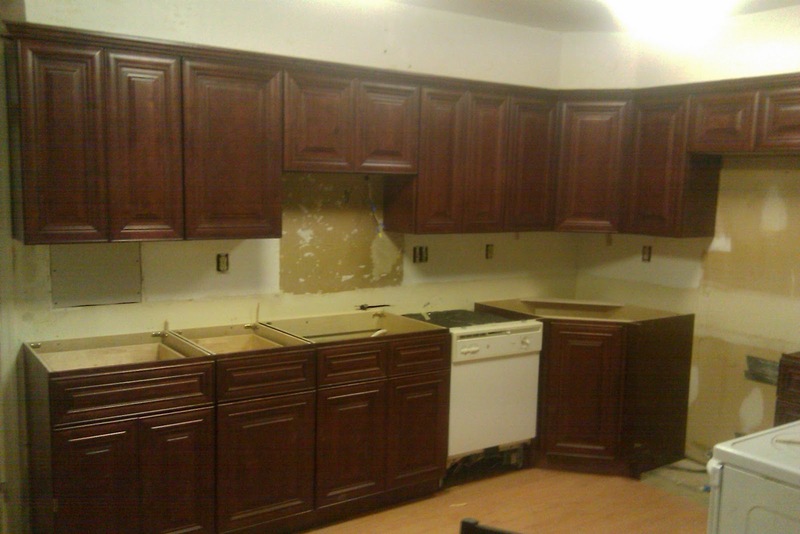 Overall pic of the kitchen renovation. We’ll definitely need to upgrade to stainless steel once more money is available. The “BEFORE” of the cabinets. They were in good condition outside, but not inside. They smelled disgusting, and I couldn’t imagine putting dishes and food in them! 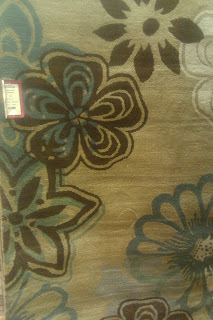 Here’s a fabulous rug that I saw at Home Goods. Unfortunately, it was $200, which was not in my budget at the moment. 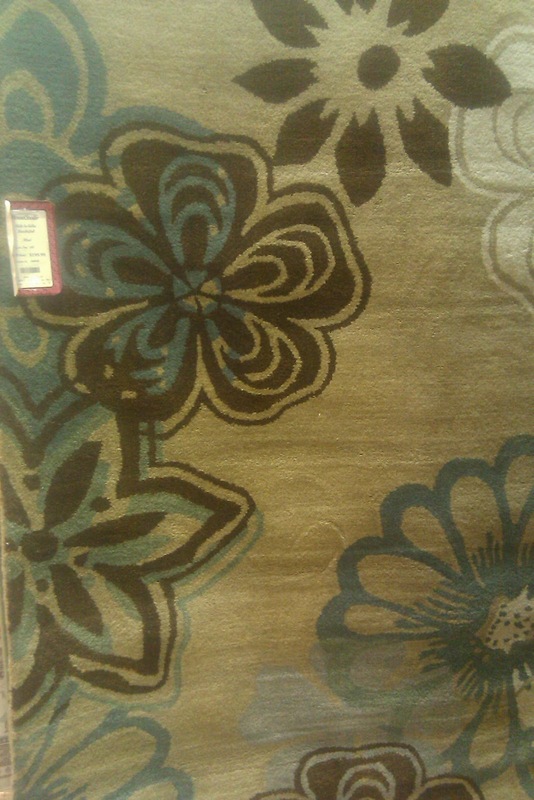 But it has the turquoise and brown that I love. A gorgeous light turquoise flower pillow at Target that I’ve gotta get!! This is the color I want my bedroom walls to be! 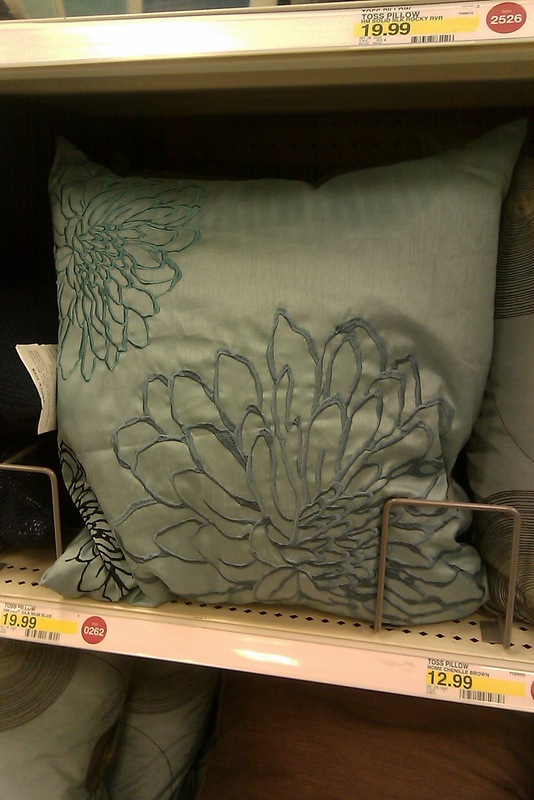 I HAVE THAT PILLOW!!!! I’ve been searching through your blog (this is a blog…right? im so NOT up to date on the internet stuff here.) ANYWHO – I think we should be friends. because apparently, we are very much alike. Turqoise and brown (or blues and brown) are my fave combo too! Love your site 🙂 i am mod podging some shelves right now, thats how i cam upon your site-thing. I too, am an avid thrifter (comes from being poor LOL) There are TONS of thrft stores around here! Happy hunting!